Australian Boulder Opal (Ovl 16x12 mm), Natural Cambodian Zircon and Tanzanite Ring in Platinum Overlay Sterling Silver, Silver wt 5.8 Gms. Ethiopian Welo Opal (Mrq 1.020 Ct), Natural White Cambodian Zircon Cluster Ring in Platinum Overlay and Yellow Gold Sterling Silver 4.700 Ct, Silver wt 9.60 Gms. Boulder Opal Triplet (6.00 Ct),Cambodian Zircon Platinum Overlay Sterling Silver Ring 7.140 Ct.
Australian Boulder Opal (Pear), Multi Gemstone Ring in Two Tone Sterling Silver 4.750 Ct.
Opal, the birthstone for the month of October, is a magnificent gem and was considered to be a symbol of love and hope by the ancient Romans. Owing to its ability to radiate all colours, it is also regarded as the luckiest and most magical of all gems, and hence, finds a great use in jewellery making. Opal Rings have emerged to be a favoured accessory among women the world over, and especially for the gorgeous ladies of UK. TJC has brought an extensive array at exceptionally reasonable prices. Designed and crafted by skilled artisans, our ladies’ opal rings feature the entire spectrum with the vibrant Ethiopian Welo, Green, Orange and Fire, the soothing Peruvian Pink and Blue and the dramatic Black, Dendritic and Boulder Opals set elegantly in Sterling Silver and 9K, 14K & 18K Gold. At TJC, we have artistic pieces in cluster, floral, solitaire, crossover, trilogy and cocktail to accentuate your look at every occasion. Don a solitary opal or a designer piece from the Jewels of India collection every day through the week for a perfectly put-together look or put on a beautiful ring in floral or cluster setting to add instant glamour to your sun-down ensemble. Owing to the assortment of the rainbow found in this smooth, glittering gem, it can be paired beautifully with the vibrancy and grace of posh gold. Our gorgeous designs of these rings bring you some remarkable features laid in the different tones of gold. Be it the radiant and traditional luxury of yellow gold, pristine enigma of white gold, or darling softness of rose gold, we’ve got a little something for every taste. 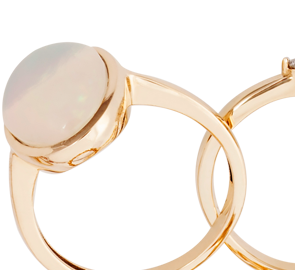 Don’t miss out on our tasteful and regal designs of opal rings in yellow gold. Affordable yet promising, opal rings in silver are loved by all. Their rich and lasting shine offers you the promise of eternal use without any tarnish. Our designs have been detailed and styled to meet your expectations of rich jewellery that you can fashion every day. Come and look at the hundreds of features we have assorted, exclusively for you. Some of these have been plated with premium metals for a pricy glow, like gold (yellow, white, and rose,) platinum, rhodium, and as such. Seeing that as ancient Romans considered opal as a symbol of love and hope, it makes for the best engagement rings. It is not only aesthetically hypnotizing, but also holds a lot of meaning. The transcending and iridescent hues of it catch light from every angle, making it glow. Our brilliant designs of engagement rings are curated with your tastes in mind. Elegant, delicate, and eternal, these will be your forever fixes. Don’t miss out on our coveted white opal engagement rings in white gold. Opal doesn’t only exude several different colours, but also comes in different shades, too. Our spectacular features of black opal rings have gained the fancy of several admirers. Other colours such as blue opal, golden opal white opal, and such more have been featured here, all yours for the take. In fact, our opal eternity rings also display some of these majestic delights, so don’t miss them out. Our selection presents you only natural and real opal rings in UK. These pleasantly hued delights are mined straight from their sources and offer an exceptional grade that you won’t find anywhere else. Another reason for picking us has to do with our pricing. We offer you a lovable range of affordable opal rings in UK that are coveted and desired by countless. Explore that pieces that your pockets are going to love!